Darrell Jones at MCI Shirley on August 22, 2015. Darrell Jones has steadfastly maintained his innocence in a murder that has kept him in prison for more than three decades. 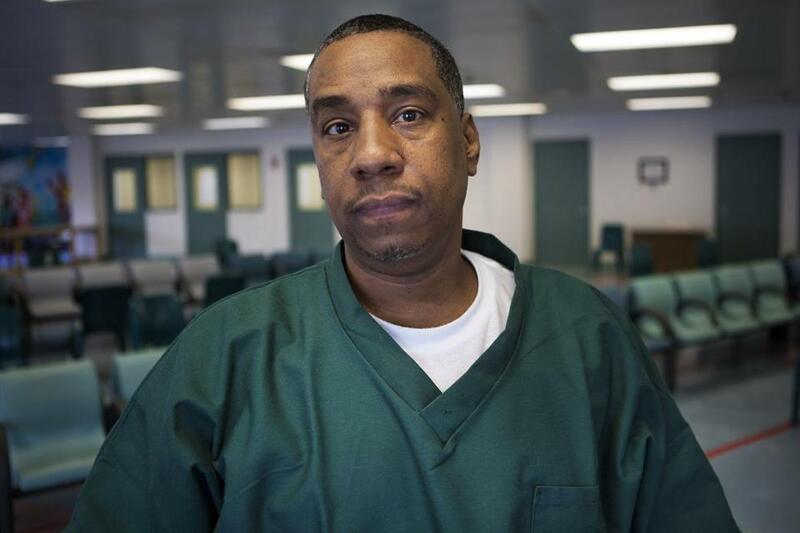 On Tuesday, on his third attempt, the 50-year-old Boston man learned he would get a new trial. After a three-month review of the case, Superior Court Judge Thomas F. McGuire Jr. overturned Jones’s conviction for the 1985 murder of Guillermo Rodriguez in a Brockton parking lot, saying the case was tainted by racial bias and misconduct. “Since the defendant did not receive a fair trial, his conviction cannot stand,’’ McGuire wrote in a 39-page ruling released Tuesday. Jones’s attorney, Lisa Kavanaugh, said she was notified of the decision Tuesday morning and drove directly to the state’s maximum security prison in Shirley to tell her longtime client the news. She plans to file a motion Wednesday morning for his immediate release. Jones filed a motion to reopen his case in 2015 based on allegations that police tampered with a videotaped interview of a key witness to remove exculpatory evidence. The tape, shown at his trial, was pivotal because none of the eyewitnesses testified in court that they were sure Jones was the shooter. McGuire, who now presides in Bristol County Superior Court, is hearing Jones’s case because he was seated in Plymouth when the motion was first filed. He wrote that he first learned of allegations of racial bias as part of a 2016 investigation published by the New England Center for Investigative Reporting and WBUR public radio. Juror Eleanor Urbati, a white Hingham resident who always regretted convicting Jones, told NECIR that two jurors had told her they thought the defendant was guilty because he was black. In September, McGuire summoned Urbati to court as part of a reexamination of the Jones verdict in what is believed to be the first such review in Massachusetts since the US Supreme Court ruled in March that a trial judge must pry into typically secret discussions if there is evidence of racial bias. McGuire also interviewed three other jurors who couldn’t remember any allegations of racism during deliberations of the all-white panel. “It was clear” the case had “weighed heavily” on Urbati over decades, he wrote. McGuire also wrote that he supported Jones’s allegations that a videotape recording of witness Terri Lynn Starks had been manipulated. Jones claimed police tampered with the videotape played in the courtroom, in which a brief segment of the “The Phil Silvers Show,” a 1950s send-up of Army life, suddenly appeared in the middle of the interview. The lead investigator on the case, Brockton police detective Joseph Smith, called the glitch an honest pretrial mistake in handling the tape. But forensic specialists and lawyers working for Jones, using technology not available at the time of the trial, said the recording was not the original and was missing up to two minutes of the interview. To examine the allegations, McGuire summoned Smith, now retired, to testify. Smith told the court that he did not have “the technical ability” to delete material. But McGuire determined that testimony to be false. He said Smith knew how to edit the video and provided false testimony to the jury — but did not conclude he was the one who manipulated the tape. He said Smith, realizing the tape had been altered, feared that admitting this to the jury “would appear highly suspicious” and instead gave a false explanation. McGuire determined that if the jury had known of Smith’s “false testimony and that the police edited the recording” the jury may have ruled differently. “Because Det. Smith’s false testimony could have affected the jury’s judgment, a new trial is required,” he wrote. Smith, now 76 and reached at his home, said he was surprised by the judge’s decision. He said he worked at the Brockton Police Department for 30 years. “First time I have ever been called a liar,’’ he said. The New England Center for Investigative Reporting is a nonprofit news center based at Boston University. Jenifer McKim can be reached at jenifer.mckim@necir.org. For more information on the Jones investigation, go to necir.org. Correction: An earlier version of this story misspelled the name of Guillermo Rodriguez.